By pure coincidence, I had three ruby slipper-themed posts in mind, so I decided to add two more and make it unofficial Ruby Slippers Week. Which, as far as I'm concerned, is a brilliant idea and should culminate in my my receiving a brand-new pair of sparkly shoes. So let's kick off Ruby Slippers Week! 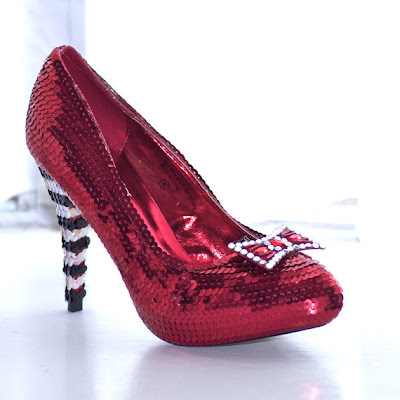 I know I mentioned Cybertosh's fabulous replica ruby slippers ages ago, but I recently revisited his Etsy store and found an even cooler design he's dubbed the Witches of Oz stiletto, which combines the classic ruby slipper design with a higher heel that references the Wicked Witch of the East's infamous striped stockings. In the years since I last blogged about his gorgeous shoes, I still have not managed to acquire a pair (I'm so skittish about ordering shoes without being able to try them on first), but I think I'm glad I held off—I like this new design even better than the original! That etsy seller probably got the idea from the Iron Fist pair of Ruby Slippers. I like the Iron Fist ones better (actually been shopping around trying to find them for less than $100 since they were a 2009 release) and I figured I'd share with you since you'd probably like them too. Yeah, I'd seen those and they are really cute, too (especially the house on the sole, which I hadn't noticed before!). I prefer the closed toe and the style of bow on the Etsy shoes, but it was a tossup. I wouldn't say no to either pair! I sure hope I find them!